The end is in sight on my Solstice Dream project, not that there isn't still a fair bit of work to do on the borders. I love how it looks with all the blocks pieced together though. I have had a pile of interesting books from the library, that I am slowly working my way through. So far I have read and enjoyed The Cactus by Sarah Haywood and The Sixteen Trees of the Somme by Lars Mytting. Scenes from the farm my daughter's archery club is located at. Lambing season is just starting. I sat in the car sewing and being entertained by the sheep while she was traipsing through muddy swampy paddocks and climbing up and down hills on the 3D target course. Finally working on my Solstice Dream project again. I'm up to the bees on the last block needed to complete the centre panels. I have to admit I have been a bit hesitant about making these bees. The stitch used is called Turkey work, or Turkey knots and is actually what is used to make Turkish rugs. After watching a couple of you tube tutorials, I had a couple of practice attempts and then on to the real things. Gosh they use up a lot of thread, and make a bit of a mess when it's time to trim them. The result is a very tactile if somewhat unusual coloured bee. Only two to go, though I think my hair cutting skills need a little work before I'm totally pleased with them. I have actually been doing other things apart from coat sewing lately, so here's a little rundown of what is happening behind the scenes. Loving // All the good reads I have had lately from my library. Feeling // Very virtuous - I went to my weekly yoga class, then spent a couple of hours in the garden, cutting things back for spring. I can see where I've been, however there is still quite a bit more to do, but that's a job for another day now. Making // A new felt and embroidery project - this one won't take long, then it's back to my Solstice Dream. Check out that glitter felt !! Dreaming // Of making some summer clothes, I must finish a couple of WIPs before I get distracted again though. 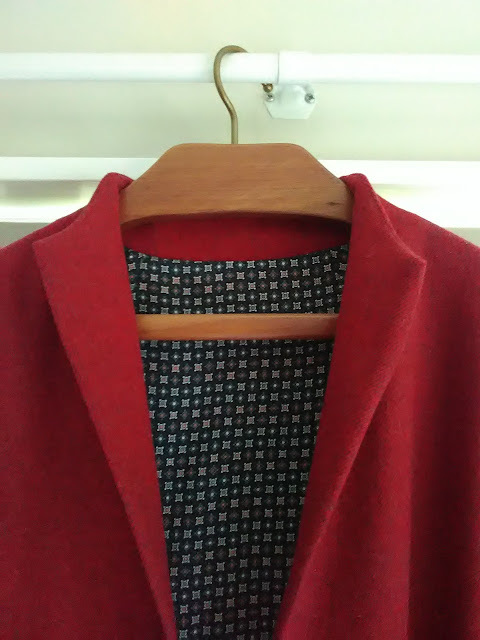 When I first fell into the rabbit hole of indie pattern designers, and discovered Papercut Patterns earlier this year, I immediately feel in love with their Sapporo Coat pattern. I loved the diagonal pocket seam on the front and the elegant cocoon shape. This coat has been on my want to make list, but relegated down the list as being to hard. Fast forward to winter, and cooler mornings, a workplace that doesn't have aircon/heating all the time, and I decided to be brave and make this. I visited Draper's Fabrics in Newmarket during their birthday sale, and purchased a beautiful cherry red and grey wool/linen/cotton blend fabric, that's not to thick, not too light, still cosy feeling and a lovely patterned viscose for the lining. I have read numerous blogs and reviews saying that it is quite an oversized coat, so I made the smallest size available xxs/xs. I didn't feel confident enough to adjust seam allowances or alter the pattern any further this time. Cutting out the pattern seemed to take longer that the actual sewing of the garment, and I made tailor's tacks on all the markings instead of cutting notches. Papercut Patterns have a lovely detailed little instruction booklet with all their patterns, and I did refer to these youtube tutorials for help occasionally. Overall I am really pleased with how this has coat has turned out. There are a couple of little maker's faults with it, but no one notices them and I'm not going to point them out.